Friday Counseling Issues: Say the Truth! If you could force all of your clients to do one thing, what would it be? Any counselor who has been in the business for a while develops a sense of when the client is fudging the truth. There are some reasons why people do this, and not all of those reasons are about making other people look bad. One reason people lie is that the truth is just too painful. They have spent years blocking it, stuffing it down, denying it. That’s a hard habit to break. It shows up the most often in those who have been sexually abused as children. Telling the truth about what happened to them is very hard, partly because they have been conditioned for years to cover it up. The victim reaches a point of not really knowing what was truth and what is false. He doubts his own memories, believing he is making things up because he has been told he’s doing so just to get attention. The truth is, very few children are making it up. It does happen, but it’s rare. There are other behaviors that go along with sexual abuse symptoms that don’t show up if the child is just making up the story. Other reasons people lie? Well, some folks, by nature or nurture or both, really believe they have to be right every single time. By hook or by crook, they will win. If they have to lie to do so, it’s not their fault. if other people woud only see that they are wrong, always, then the counselee wouldn’t have to lie. This kind of thinking can be part of a sociopathic person’s make-up. It also can be indicative of an abuser, who always blames his behavior on the person he’s just beaten into submission. Some people are just so mortified by what they’ve done that they can’t bear to own up to it. They want me to fix them without really understanding what I’m dealing with. Some people want me to fix everyone else in their lives so they can stop lying. Some want me to tell them their lies are justified. Sometimes, maybe they are. WHAT?? HOW CAN YOU SAY THA??? LYING IS NEVER OKAY! Remember that the next time a lie slides out of your mouth, and quit being so quick to judge. I will never condemn a mother, for instance, for lying to an abusive husband to protect her child. What I will do is encourage her to remove herself and her child from the situation so that she doesn’t have to lie any more. I cannot condemn her for saving her child from a terrible beating. I will never condemn anyone for lying to protect his family from a murderous intruder. You do whatever you have to do, and worry later about the ethics of not telling the whole truth. I will never condemn anyone in a war or terroristic situation for lying to protect himself or others. I will take you to the story of Rahab in the Bible, who lied to protect the two Israeli men who were hidden in her dwelling. She did the right thing. She was never condemned by God for her lie, and she was also a part of the lineage of Jesus Christ. I realize these are extreme examples that most of us will not face. Some of the people I’ve worked with have been in such extreme dangers, and they struggle with lies they may have told to protect themselves and others. You may not agree with me, and that’s fine, but I always try to encourage these people that they did what they had to do and they are not to be blamed. Getting back to the counseling office, the importance of telling the whole truth is simply this: I cannot help you if you are not telling me the whole truth. It will eventually come out anyway, and then you will feel embarrassed for not having told me sooner. Sometimes we lie by omission, you know. We simply leave out what we don’t want to put words to, hoping that by not saying those words, the truth will disappear. That never works. You can’t give a seamstress all your measurements except one and then expect her to hand you a perfect result. There’s going to be someplace that doesn’t fit quite right, and you’ll never be satisfied with the garment. Same goes in counseling. I’ll do the best I can with what you give me, but if you leave anything out, the fix will never be completely satisfactory. They were at their wit’s end. They hadn’t been able to find two witnesses who could agree with each other about anything Jesus had said or done that rose to the level of blasphemy. He wouldn’t speak to defend Himself, so they couldn’t try to trip Him up with arguments that would trap Him into making a false statement. There was only one thing left to do. They would have to put the BIG question to Him; they would have to ask Him outright if He were theChrist, the Son of God. I think it is ironic that Caiaphas adjured (required, ordered, demanded) Jesus, in the Name of the living God, to say whether He was indeed the Christ that the prophets had foretold. And Jesus knew that His answer would seal His death warrant. It was the only question He would answer. Stay tuned for His amazing statement. We’ll look at it on Monday, March 2. 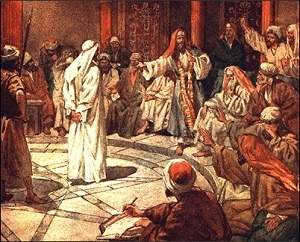 The only way the Sanhedrin (the council) could condemn Jesus to death was to accuse Him, and prove Him guilty of, blasphemy. Of course that was impossible. In one of His discourses, Jesus had asked the crowds, “Which of you convinces Me of sin?” And no one could. He was not guilty of anything, and there was no evidence, no proof, of His guilt. How frustrated the leaders must have been. 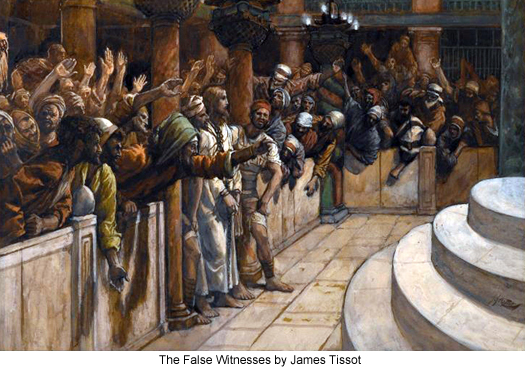 Here they had Jesus, finally, bound and brought before them as a criminal, and though many false witnesses came before them with stories against Jesus, they could prove nothing. It was going to be a long night. Then, two men came forward. They accused Jesus of saying that He could destroy the Temple of God and build it again in three days. Aha! Finally, they had something they could work with! The trouble, of course, was that it was a wrong quotation of His words, and a wrong application. And we can read in Mark’s gospel that the witnesses couldn’t even agree with each other. It would be impossible to convict Him of such a charge. The chief priests and scribes were so angry by now that they taunted Him, trying to get Him to respond. There was one thing left to try, one way they could trap Him into saying something they could use against Him. At this point, He had said not one single word. His silence drove them crazy. He MUST be made to speak! I failed to note a most important statement in the verses from yesterday’s post: At the end of verse 56, we see the pitiful statement, “Then all the disciples forsook Him, and fled.” How utterly sad! When they could see that there was no saving Him from arrest, they forgot all about His great power. They forgot how much He loved them, and that they, too, loved Him. In their great fear, all they could do was run away. So Jesus was hustled off to Caiaphas, the high priest, where he and the scribes and elders waited with great anticipation for His appearance before them, humbled at last in the face of their great power and authority. This time, they had Him! Everything was arranged, and the trial could begin immediately, with false witnesses ready and waiting to do their damage. But wait, here’s Peter! He followed at a safe distance, but at least he followed! When he arrived at the palace of Caiaphas, he blended in with the servants gathered there and waited, as the scripture says, to see the end. Did he finally get it? Did he finally understand that Jesus must die? Indeed, one wonders why such a militant group came to arrest Jesus, Who had been a friend to them; eaten with them; taught them in the temple; healed their sick and cast demons out of some of them. Why did they think they needed swords and cudgels to take Him? It was, of course, a fulfillment of prophecy (Zechariah 13:7). I believe, as well, that they knew they were doing wrong and they were doing all they could to make it seem right and justifiable. As we move into the “trial” of Jesus, we’ll saw all the efforts that were made by the Jewish leaders to make their case plausible to the Romans, who had the power of execution. Describe your ideal client? What would they do or say in your first session? Once I had a man come swaggering into my office and try to lay down the law: He would control the session; he would decide when and if his wife would speak; he would not put up with any hint of blame or accusation from me toward him, because he was the MAN, and he didn’t need any advice or so-called counsel from a mere woman. I almost fell out of my chair laughing 🙂 The session ended in about ten minutes, when I began to inform him that I would be in charge; that this was MY office, MY rules; and that if he couldn’t deal with that maybe he’d come to the wrong place. It didn’t take long to say goodbye. So now you know what an ideal client is NOT. I got a new client two weeks ago who, in my experience, embodies everything a therapist could hope for. She was obviously distressed, but friendly and open. She was nervous. They all are when they come the first time. There are so many goofy stereotypes out there about therapists. She allowed me a few minutes to get my paperwork started before she began to talk. Once that was done, I said what I always say: “So, (name), what brings you here today?” Sometimes the person can immediately speak freely. Not always. If they don’t seem to know where to start, I’ll say, “Let’s try this: You fill in the blank. “I’m here today because_________.” That usually does the trick. The first session almost always belongs to the client. Once they get started, they have no trouble filling up the time while I type notes. Sometimes their stories are disjointed, but it doesn’t matter. We’ll go back and put things in sequence later. The ideal client states her problem clearly, giving necessary details but not cluttering things up with extraneous information. Then I can start asking questions. I will usually ask the person to give me a straight “yes” or “no.” You can’t imagine how hard that is. “Well, yes, kind of, but. . . . .” In the first session, I don’t need all the BUTS. An ideal client tries to honor my request for short, clear responses. An ideal client tells the truth, the whole truth, and nothing but the truth. Seriously, how can I possibly be helpful if you lie to me? Of course I understand that one person’s perspective will be different from another’s, and I take that into account, especially in marital counseling. But it would be silly for anyone to come for help. PAY for help, and not to tell the truth. The ideal client is willing to acknowledge his own contribution to the problem. He doesn’t come in with the expectation that I’m going to fix the people who aren’t there. He accepts that he can’t change anyone else; he can only change the way he reacts to everyone else. The ideal client actually does whatever “homework” I may ask for. I don’t give much homework, because my experience has been that there is a hasty, if any, attempt to finish just before the session starts. Here’s one that may surprise you. The ideal client tells me if she doesn’t approve or accept something I’ve said, or that I’ve offended her. She then accepts my heartfelt apology, and we go on from there. I never, ever want anyone who feels hurt or offended to leave my office with that simmering in her heart. I’ll never be able to help her if we don’t clear it up right away. Finally, and most important to me, the ideal client embraces my use of scriptural principles in counseling. Makes the work so much more effective. What if they don’t? Do I ram Bible down their throats? Of course not. I would never do that. I don’t have to have my open Bible in front of me to counsel from a position of truth. I’m thankful that most of my clients welcome the use of the Bible and biblical principles. I can think of only two who have elected to go elsewhere because they weren’t comfortable with biblical counseling, even after I assured them that I would honor their preference. The ideal client comes seeking help, willing to listen, willing to work, willing to change harmful patterns of thinking, willing to consider the option of medication, willing to accept his own responsibility. And I have a lot of them like that. It’s a beautiful thing. How much power would twelve legions of angels have? You can’t even begin to imagine! A Roman legion was about 6000 soldiers. Twelve legions, then, about 72,000. In Isaiah 37:36, we read that one angel killed 185,000 soldiers in one night. On that basis, twelve legions of angels could slay 13,320,000,000. That’s 13 billion, 320 million. That number is hard for me to comprehend. Statistics say that there are now about 7 billion people on earth. It would take only half of twelve legions of angels to deal with that! If Peter, or all the disciples, or the angels of heaven themselves should intervene and save Jesus from the cross, how then could the scriptures be fulfilled that He must die so that we might live? He was born to die. He never asked to be spared from that, knowing that His death and resurrection was the only way of salvation for all mankind.